This black velvet and crystal combination is available as a harness, collar and lead. Your pet may be a model of perfect behavior, obeying command and walking on-lead, always by your side. 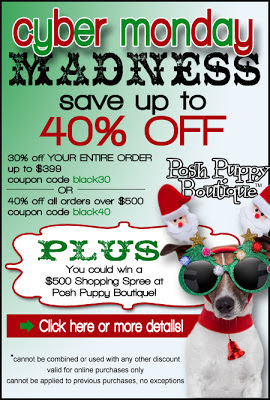 Show your fashion sense with a new Luxury Lead or harness from the Posh Puppy Boutique. Our Black Velvet Crystal Harness ($35) features rows of tightly woven tiny crystals on a black velvet background. The harness is soft, durable and simply sophisticated. Sizes range from extra small to extra large. Matching 4-foot leads are $30. An identical collar is $30. If you want something brighter, take a look at our new Fuchsia Velvet and Crystal Collar ($30). It has multiple rows of tightly women small crystals set on fuchsia velvet. Sizes range from extra small to extra large, with the number of crystals dependent on the size. A matching 4-foot lead is available for $30. Show even more sophistication and style with our 5th Avenue Collection, also available in many colors. These 4-foot leads are a mix of faceted crystal acrylic and glass beads plus an electroplated brass chain and woven leather. Color choices include crystal, gold, jet, rose and sapphire. The Haute Collection defines the ultimate in luxury pet accessories. Made with Swarovski precision-cut crystal beads, each lead has a platinum-toned brass chain handle made of leather. While these leads were created for sophisticated pet owners, they can withstand 30 pounds of pulling force. The Light Rose Crystal lead from the Haute Collection is a multi-faceted piece of (dog) wearable art. Color choices include: the Crystal Auroe Boreales ($360), Rose Crystal ($360), Light Rose Crystal ($360), Vintage Rose Crystal ($360), Hyacinth Crystal ($360), Light Peach ($360), Erinite ($360), Sapphire ($360), Light Sapphire ($360), Amythyst ($360), Topaz ($360), Golden Shadow ($360),Black Diamond, White Pearl ($360), Tanzanite ($360) and Jet ($360). These and many other items can be found by clicking the Tail Wagging Sales icon on our website. We are also asking our Facebook Friends for sales suggestions on Black Friday and Cyber Monday. Call us at 888-837-5230 with any questions. 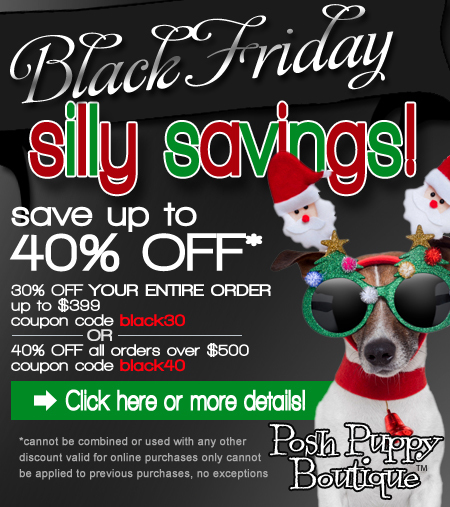 The Posh Puppy Boutique sells these and thousands of other pet products both online and at ourRocklin, Calif. Retail Store. Save some serious scratch on our Royal Dog Costume. Summer is long gone, Halloween just passed and the days are getting shorter. So what does that mean? Super savings on some great pet costumes, clothing and accessories at the Posh Puppy Boutique. For example, our Royal Pup Costume is normally $25. It’s on sale right now for $14, an $11 savings. This costume comes in sizes from extra small to medium. It will have your pooch looking like a king or queen in their bright royal red, faux fur-trimmed cape, blue satin shirt, plush crown and squeaker scepter. Take a look at our Lil’ Furrmaid Costumes, normally $27 but on sale now for $14, a $13 savings. Complete with gold crown and fish squeak toy, this outfit features a satin bodice with god sequins and a green sequin tail. It is available in medium and large sizes only. Kowabunga dude! Our Sun Protective Rashguard Shirt in Tuga Red is on sale for $14, normally $29, a $15 savings. This shirt works as a costume and to keep delicate fair dog skin from excessive sun exposure. It features a solid blue back with red, white and blue turtle designs. Available sizes are small and medium only. Made from 80/20 nylon/lycra fabrics, these shirts are lightweight, comfortable and block 97.5 percent of the sun’s rays. Get it now and be ready when the warmer days appear. Only one size of this coat is on sale right now. Also on our Super Sales Page, which changes frequently, is our Green Platinum Coat in the 26-inch wide size only. Normally $75, it’s on sale for $37, making it more than half off. This coat for larger dogs only features a breathable waterproof exterior, fleece interior and exceptionally bright ANSI 2 reflective trim for night walks. This coat is also proudly Made in the USA. Add some serious bling to your dog’s wardrobe with our Chrome Bones Safari Stud Collar. Normally $105, the brown version of this ostrich designed, leather backed collar with Swarovski Crystal charm is on sale for $53, a $52 savings. The sale price applies to the small size only. Girl pups might like our Classic Stripe Collection Neapolitan Collar, which is on sale for 50 percent off. Normally $34, it is on sale for $17 while supplies last. This collar features a pink background and horizontal stripes. The sale price applies only to the small size. Quantities are limited on sale merchandise. Prices can change without notice, so don't be dragging your tail. This Purple Iridescent Shimmer Coat is made by Yvette Ruta. Couture pet clothing creations designer Yvette Ruta are now available exclusively at the Posh Puppy Boutique. Yvette Ruta creates custom, hand-crafted couture coats, dresses and beds for the distinguished doggie. Among her products found only at the Posh Puppy is this Purple Iridescent Shimmer Coat ($310). In sizes from extra small to large (with custom sizing also available for an additional fee), it is made from a quilted purple fabric with matching lining plus a fringed bottom with ribbons. Swarovski crystals are hand sewn into the bodice. It also has a Velcro attachment for flexibility and a “D” ring for a lead. A perfect example of Yvette Ruta’s couture style is her Winter Wonderland Rhinestone Harness Vest ($290). A matching tutu is available for ($50 in pink or silver, $90 in gold). The bodice has three 6 faceted rhinestone buttons hand stitched to silver ribbon. The bottom features silver beading on embroidered metallic trim. It’s perfect for any dressy occasion, including winter weddings. It comes in sizes from extra small to large with custom sizing also available for an additional fee. Dog owners looking for a fancy, fashionable dress perfect for any special occasion should take a look at Yvette Ruta’s Couture It’s My Party Dress ($165). It features a fully lined black satin bodice. The bottom is made with layers of pink, silver and black tulle with black circles of sparkle over the top layer. A big silver bow with rhinestone middle and pink, black and silver ribbons completes the dress. It comes in sizes from extra small to large with custom sizing also available for an additional fee. This Beaded Bed lets your pooch have luxurious naps. Give your dog not the lap of luxury, but the nap of luxury with Yvette Ruta’s Beaded Trim Bed with Bronze ($660). This 18-inch by 18-inch lounger is made with solid wood and has carved rope detail faux finished and glazed in metallic bronze and coppers. The beaded trim is detailed with metals and crystals while the duvet is fluffy 1.5-inch light blue pile fur. In addition to adding Yvette Ruta’s products, The Posh Puppy is proud to partner with the American Red Cross in soliciting Hurricane Sandy Response funds. Click here to make a donation. This trench coat looks stylish and keeps your dog warm. Coats and jackets in a wide variety of styles, colors and sizes means any pet can look great while staying warm and dry during the colder months. 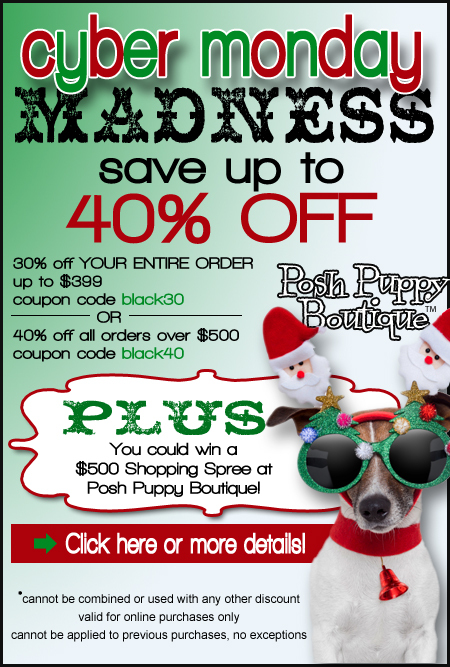 The Posh Puppy Boutique sells many products designed to make your dogs the envy of their puppy pals in terms of both fashion and comfort. For example, this Trench Coat ($86) first dogs with lengths from 8-16 inches and girths from 14-26 inches. Made with heavy weight black cotton canvas and lined with a blue and tan multi dot print, this water resistant garment comes with a removable belt. The Lourdes Coat is trimmed with Swarovski crystals. The hooded brown Lourdes Coat ($130) is stylish—it is trimmed with Swarovski crystals—is fully lined and made with soft material designed to keep boy and girl dogs comfortable. It is also made in the USA. Sizes range from extra small to extra large. When rain is more of a problem than cold, consider the hooded Puppagonia Rain Parka ($40) from Hip Doggie. It has clips on each leg designed to keep water out and your pup dry. Sizes range from extra small to big dog extra large, handling breeds from the tiny “toys” to massive beasts. It comes in pink and black. This parka also features a reflective stripe down the back. If you want something more fun and feminine, take a look at the bright yellow Polka Dots and Daisies Raincoat ($35). It has embroidered daisies on the back and a soft cotton lining accentuated with white polka dots. Sizes range from extra small to extra large. Some dogs do not like having their heads covered. If that describes your pup, take a look at our Sable Water-Repel Quilted Jacket ($90). This rich looking velvet coat offers both warmth—it is lined with Polartec ® fleece—and style topped with a faux fur collar. Made in the USA, it comes in sizes designed for breed ranging from Chihuahuas and Yorkies to Bulldogs. Color options are Golden Toffee, Brown Sable and Black Diamond. Active dogs may prefer our Apex Nylon Jackets ($50) featuring a water resistant outer shell, reflective trim and an adjustable fit. They come in sizes for dogs weighing between 3-120 pounds, meaning breeds such as Yellow Labs and Rottweilers can be warm and dry while enjoying the great outdoors. Color choices include blue, green, red and pink.